The bird fell into the container while trying to scavenge meat from a food factory bin on Monday. It was rescued by workers at the site in Wales, and picked up by a volunteer for Vale wildlife hospital, near Tewkesbury, Gloucestershire. 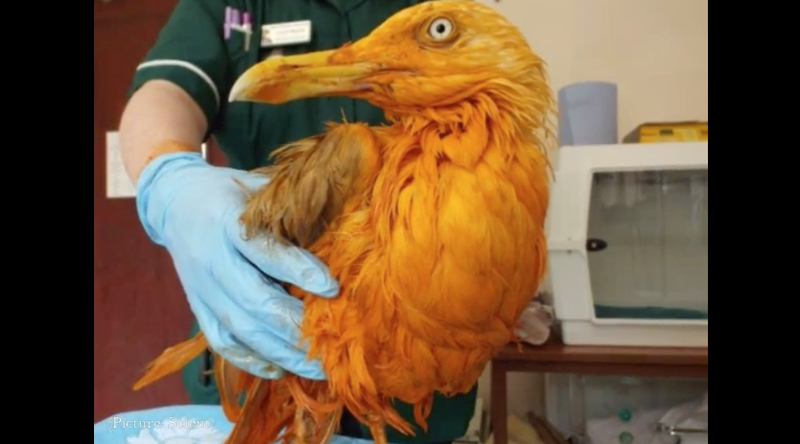 Staff at the hospital used washing-up liquid to remove the bright orange from the seagull’s feathers. They returned him to its original white colour but have not been able to wash away the smell of curry. Lucy Kells, veterinary nurse at the hospital, said: “He really surprised everyone here – we had never seen anything like it before. He had fallen into a waste vat of curry that was outside, it was chicken tikka masala. The thing that shocked us the most was the smell. He smelled amazing, he really smelled good. A nice-smelling gull that simply loves garbage: my new professional biography, found.